Of course, your Yangtze River cruise for sightseeing and leisure will be a culinary trip. Tasteful cuisines of Chinese and Western flavors are prepared by the experienced chef onboard. Dishes and drinks are not only in adequate amount but also in high standard quality in order to satisfy the diverse needs and habits of guests from different countries and regions in the world. In the well-arranged dining hall with nice atmosphere, comfortable tables and chairs, smiling service staff, and nice designs, you can absolutely enjoy great hours with the food and drinks onboard the Yangtze River cruise ship! Where to dine? Onboard the Yangtze River cruise, there are usually 1 to 2 dining halls for guests to enjoy their three meals. They are the main dining hall for most travellers and the smaller special VIP restaurant for a certain group of VIP and business guests. Onboard the Yangtze cruise, the main dining hall is usually arranged on the second floor, near the lobby, and can hold up to over 200 guests at the same time. This main dining place onboard is decorated finely and facilitated well to provide every traveller good dining atmosphere, beautiful lighting, comfortable seats and tables, and good tableware. What’s more, most main dining halls onboard are designed with the a large spread of glass window, which aims to offer more moments for people to enjoy the charming sceneries along the Yangtze River while enjoying the cuisines. 1 to 2 service staff will stand near your arranged table, and they will serve you well in English and ask about your needs sincerely and forwardly. Therefore, you all will be taken good care to enjoy your dining time onboard the ship. Usually, there is another restaurant served onboard – the VIP restaurant, or called the Business restaurant. And the name varies by different cruise companies. Compared to the main dining hall onboard, the VIP restaurant is specially prepared for guests who want to dine in a quieter and more relaxing environment. This more private restaurant is designed more elegant and luxury with more humanized lighting equipment, seats and dining tables in perfect order. Staff in this restaurant is trained professional to provide the best service for you during the whole dining hours. And usually, guests booking the executive suits and better suits can enjoy this VIP treat for free. You can feel free contact our travel consultant for the details onboard your ideal cruise ship. 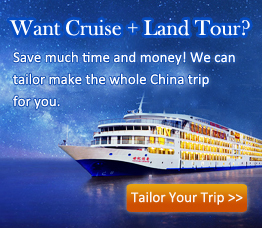 Note: the above information about the meal form arrangements of Yangtze River cruise companies is only for reference. Actual forms may be adjusted according to the practical situation after you get onboard the cruise. To let you have a better dining experience and enjoyment onboard the Yangtze River cruise, here at below are some warm tips. Check them before you go! 1. Dining Time: onboard the Yangtze River cruise ship, the breakfast usually is arranged during 07:00 – 08:30, lunch during 11:30 – 12:30, and dinner during 18:00 – 19:00. Each meal lasts for about 1 to 1.5 hours, so you could take your time to enjoy the rich kinds of dishes and drinks. Please have your meals during the scheduled dining time, otherwise, there would be no food offered in the restaurant. However, if you miss the dining time, you could order some food by telling the reception desk, which needs extra pay. 2. Meals Included & Excluded: the meals specified with “B” (breakfast),”L” (lunch), and “D” (dinner) are included in your dining arrangement onboard the cruise, so you can enjoy them at ease. However, the dinner on the embarkation day and the lunch on the disembarkation day are not arranged, so if you want to enjoy, you could tell our travel consultant in advance or directly to the cruise company after boarding, the cruise company will arrange the dinner for you. Besides, you could choose to go to taste the local special food for the excluded meals. 3. Seating Arrangement: in the main dining hall, guests usually dine at a big round table, with usually 8 to 10 people at the same one. And since guests onboard come from different countries and regions and have diverse eating habits and speak different languages, the cruise company considerately arranges the seating based on the nationalities, eating habits, cabins and so on of guests, which gives better dining enjoyment and comfort to them as much as possible. 4. Vegetarian & Special Dining Needs: if you have any special dining needs, such as vegetarian, salt-free, low-carbohydrate, Kosher, etc. you are required to tell our travel consultant when booking or directly to the reception desk a half to one day earlier before the meals, and the chef onboard the cruise could arrange special cuisines for according to your needs. 5. Room Services: if you want to enjoy your meals in your room, tell the staff at the reception desk and give some extra payment, and then they will arrange such room service to send your food in your cabin. Menus of each meal are elaborately designed and arranged by each cruise company for your Yangtze River cruise. A great number of cuisines and beverages are prepared by the experienced culinary teams who have high demands of food onboard. People of diverse dining needs, likes and habits from different places of the world can have a great tour of gourmet, with the yummy cuisines of Chinese, Western, Japanese, Italian, French, and so on. Since menus for the breakfast, lunch and dinner are changed daily and according to the food materials in season, guests can enjoy more different types of food through the holiday if they go in different months. Let’s check a part of the menu for breakfast, lunch and dinner onboard the Yangtze River cruise for reference. Cereal: cornmeal, rice crispy, corn flakes, coco pops, oatmeal, etc. Congee: oatmeal porridge, rice porridge, vegetable porridge, etc. Milk/Yogurt: cold milk, degrease milk, hot soybean milk; yogurt, etc. Jam: strawberry jam, honey jam, blueberry jam, condensed milk, etc. Egg station: fried egg, scramble egg, omelette, ham, boiled egg, etc. Pancake station: French fry toast, battercake, etc. Chinese noodles station: wonton, dumpling, noodles, etc. Chinese dim sum: steamed bun stuffed with pork, milk steamed bun, steamed bun stuffed with barbecued roast pork, steamed creamy custard bun, etc. Bread: bake toast, English muffin, croissant, Danish, French bread, rye bread, Doughnuts (sugar, chocolate), waffle, etc. Appetizer: salami, mushroom sausage, peanuts, cheese plate, etc. Fruit: pineapple, banana, watermelon, pitaya, sliced seasonal fruit, etc. Salad: cabbage salad, green bean salad, farfalle paste salad, cauliflower and herbs, German potato salad, sweet corn & bell peppers, chicken salad, cucumber salad, tuna salad, etc. Dressings: thousand island dressing, vinaigrette, French dressing, etc. Appetizers: sweet and sour fish stick, cucumber cubes with mashed garlic, sushi with pickled ginger and wasabi, sliced port with garlic sauce, marinated celery, chilled aloe, deep fried marinated drumstick, mixed vegetable with sausages and wasabi, etc. Bread: pizza, whole-wheat, and other assorted bread. Soup: creamy pumpkin soup, corn & chicken soup, borsch, creamy assorted mushroom soup with vanilla, Italian vegetable soup, etc. Main courses: grilled chicken with paprika and garlic, beef braised with carrot, German deep fried pork chop, steamed egg with minced meat, black pepper beef, fish balls with vegetables, stir-fried fish fillet, flavored pork ribs, Kung Pao Chicken, shredded pork with garlic sauce, etc. Vegetable: mixed stir-fried vegetables, assorted vegetable with curry, etc. Pasta station: spaghetti, penne, tomato sauce, farfalle, etc. Dessert: strawberry mousse, jelly, American cheese cake, tiramisu, pumpkin pie, Napoleon cake, black forest cake, banana pudding, chocolate puff, etc. Sandwich & pizza: ham and cheese sandwich, pizza with salami and mushroom, etc. Dinner onboard some Yangtze River cruise ship is served in buffet free style. Check some part of the detail dishes for your reference. Salad: lettuce, red cabbage, onion, tomato, fruit salad, etc. Dressing: French dressing, Italian dressing, vinaigrette, etc. Cold dishes: mixed beef, fish with black bean, etc. Hot dishes: shrimp hamburger, roasted drumstick with syrup, black pepper beef, charcoal-grilled pork, multi-colored meat balls, flavored steamed river fish, steamed egg custard in seafood flavor, steamed yam, roasted sweet potato, etc. Dinners are arranged in Chinese sit-down style onboard some Yangtze River cruise ships, especially for the Captain’s Farewell Banquet Dinner. Let’s see the referential menu for a Chinese sit-down dinner as below. Onboard the Yangtze River cruise ship, you can drink in the restaurant, in your room, in the bar or café and during the Captain’s Welcome Party. In the restaurants, many kinds of drinks are served in adequate for your favor. The professional staff would serve at your table, and you could choose from the coffee, cola, sprite, tea, juice, hot water, and other soft drinks and wines and so forth as you like. Drinks are refillable. Apart from that, if you want to enjoy more beverages, you can go to the bar or café onboard the ship, where a lot of diverse kinds of brands of drinks are served with extra fees by the sweet staff. You can choose from cocktails, sparkling wines, champagnes, gins, tequilas, bourbons, whiskies, rums, vodkas, brandies, cognacs, liqueurs, coffees, Chinese spirits, bitters, beers, soft drinks, teas, hot drinks, juices, and so forth. During the Captain’s Welcome Party onboard Yangtze River cruises, you can enjoy beverages for free. Good drinks like juicy, champagne, red wine are enough provided for you to go with the delicious fruits, desserts, and some special snacks for your leisure moments receiving the warm hospitality and welcome from the cruise captain and staff. 1. The minimum legal drinking age onboard Yangtze River cruises is over 18 years. 2. If you want to take your own drinks onboard Yangtze River cruise ship, you can enjoy them only in your cabins, but not to bring to the restaurants, the bar or the café. What are current prices for beer, basic spirits ,tea and coffee on Yangtze River cruises ? Thanks for your question! I’m sorry there is no detailed price for beer, basic spirits, tea and coffee on Yangtze River cruises, for the price of those items may be different according to different cruise ships. Onboard Century cruises, the price of each soft drink like sprite and coca cola varies from RMB25 to RMB35, while the price of coffee and tea varies from RMB25 to RMB55 per cup or per pot. The price is only for you reference, you could know the detailed price by asking the reception desk onboard for help. Besides, there may be several kinds of drink packages onboard too. If you are in need, you can also ask the reception desk for help, with your room card carried.